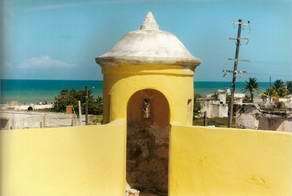 eastern part of Yucatan, was the main port of entry and exit to the rest of the world in the 17th century. 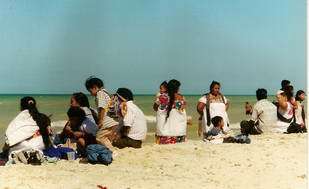 name of "Sisal " in the foreing countries due the name of this, by then very important Yucatan port. pirate´s attacks, which through the time has suffered some changes; it is a two stories building, the bottom floor has a vestibule, 7 rooms and a patio, the second floor has two water cisterns, the light house tower and a masonry stairway that permits direct access from the street. Now the "Castillo de Sisal" is the Museo del Mar home.